Attachment Parenting International suggests breastfeeding on demand, at the first cue (before crying), and for comfort as needed. If possible, it is recommended to exclusively BF as long as your baby wants to. Don't arbitrarily start pushing solids once they reach a certain age, even when your sister, friend, doctor tell you it's time. 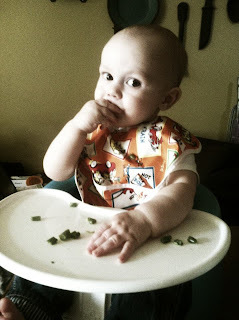 Your baby will let you know when he is interested in solids. Watch for cues that your baby is interested in food. Once he starts reaching for it on your plate, offer him a reasonably sized piece, and see what he does with it. If he doesn't eat it, he doesn't want it. Please put the spoon down and step away from the meat-in-a-jar nonsense. They will eat till they are full, unless they are not in control of it. Get it? 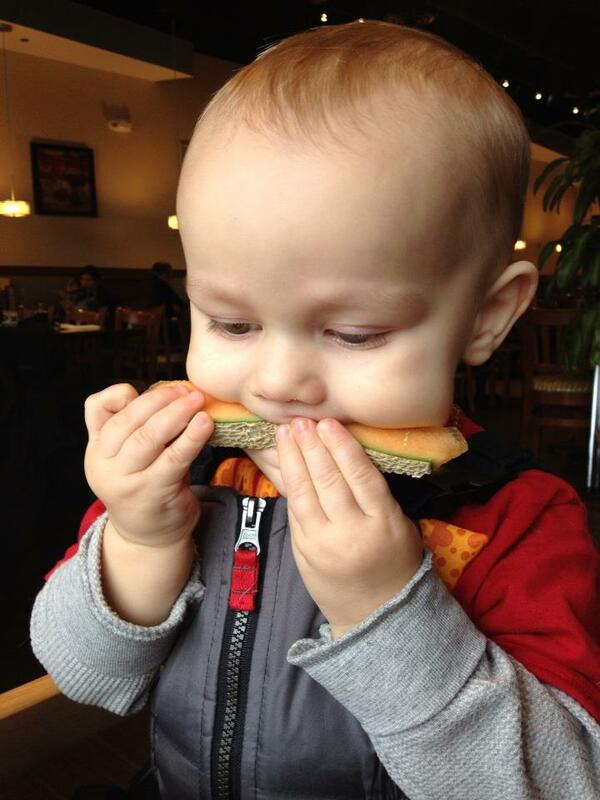 Technically, this is called Baby-Led Weaning. Yet another frustrating label. Weaning implies that you are eliminating breastfeeding all together. In reality, you are supplementing at the individual baby's own pace. So wouldn't that just be called Feeding? Beans were a favorite right away. 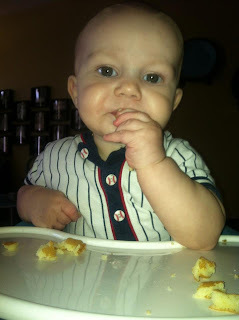 My Lil' Monster eats virtually everything put in from of him. There are no force fed hours spent at the table. He lets me know when he is hungry, and I feed him. Here are some of the tips that I attribute my kiddo's amazing eating habits. Small meals all day, when he is hungry. I "allow" him to stop when he is full. 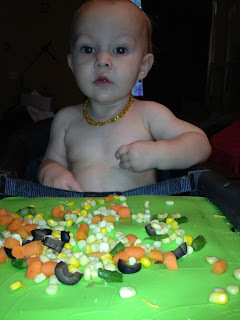 Toddlers don't want to sit at the table for long periods of time, and they shouldn't be made to. A friend of mine lovingly calls this Jackson's 'baby buffet". I try to model healthy eating habits. Do I do this perfectly? Absolutely not . . . however I have recently eliminated Gluten, and I am eating a LOT more green. It's a work in progress. I never force him to eat anything. Actually, this hasn't yet come up with Jackson, but I think it's important to keep this in mind. I try to make time for at least one meal a day to connect. Even for a short time. We talk and joke. 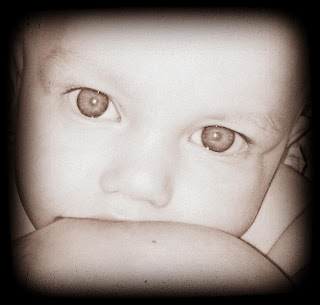 I want this to continue as he grows, so I am starting this early. In my opinion, I don't agree with food being used as a reward or punishment. It is nourishment, and eating shouldn't be contingent on behavior. (aka "No dessert if you don't behave") I have a feeling that I will be eating my words on this one someday, but I think if I keep desserts out of the picture for the most part, it is doable. Personally, I don't believe kids are born picky eaters. I have watched parents subliminally pass their dislikes on to their kids. 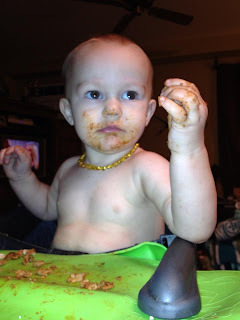 All it takes is one "gross" facial expression for your baby to steer clear of certain foods. Let them decide for themselves. I HATE sweet potatoes, yet Jackson LOVES them! It's all in the approach, I think. Avoid drive thru restaurants. Have I let him try a french fry? YES, but it is not a habit I am willing to help him start. There is really no reason for it. 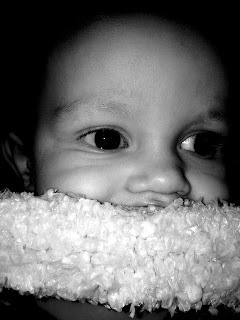 As always, I am just sharing what I have chosen to do with my lil' man. I am not implying that anyone making decisions different than the ones above, are doing a disservice to their children. We all do the best we can, and sometimes we need/want a little guidance. 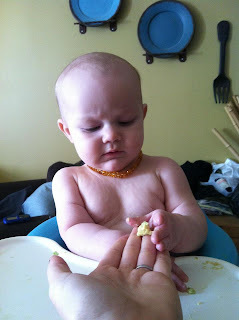 I don't have all the answers, and I would LOVE to hear how you handled introducing food to your little ones. What worked, what didn't, and what would you have done differently?